← Where do continued high oil prices lead us? 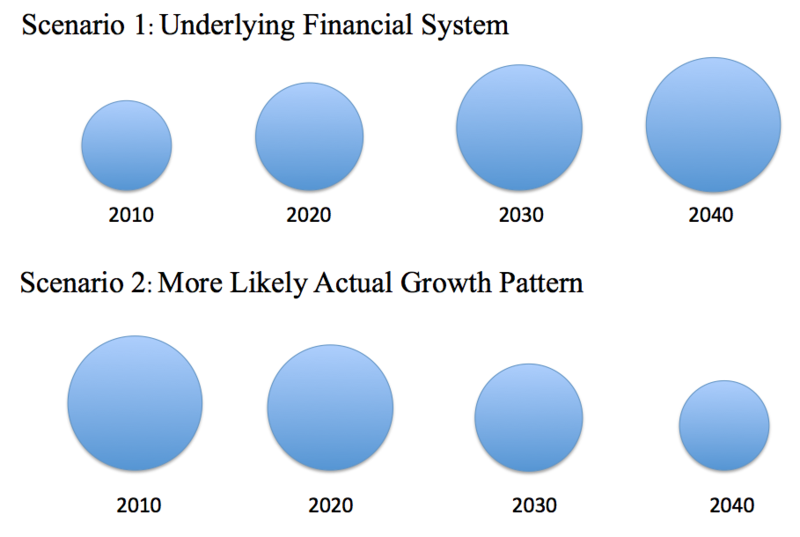 In a recent post, I talked about why we may be reaching Limits to Growth of the type foretold in the 1972 book Limits to Growth. I would like to explain some additional reasons now. In my earlier post, I talked about how rising oil prices are associated with rising food prices, and how these high prices can make it harder for borrowers to repay their loans, as is now happening in Europe. These same problems can lead to a contraction of credit availability. A contraction in credit availability can be doubly problematic: it can lead to a cutback in demand because buyers cannot afford goods using oil, such as new cars, and it can lead to a drop in financing for industrial uses, including expanded oil drilling. All of these issues may lead to contraction of the type expected in Limits to Growth. US governmental debt limit problems and European debt defaults are also outcomes of the type expected with rising oil prices. In this post, I would like to discuss some other basic issues that seem to be associated with Limits to Growth, and that may eventually lead to an abrupt downturn or collapse. 1. The over-use of resources by humans seems to be of very-long standing origin, dating to the time-period 100,000 BC when there were fewer than 100,000 people on earth. Capitalism today is an extension of this long-term pattern. 2. World systems often seem to work as a gradual build-up of forces followed by a cataclysmic release. Examples include earthquakes and hurricanes. Even getting hungry, and then eating, follows this pattern. A similar pattern may happen with the Limits to Growth that we seem to be reaching. 3. The extent to which humans can gather resources for their own use depends on their geographical reach. As hunter-gatherers, our reach was quite limited. This reach has gradually grown through inventions such as ships, through the settling of new lands and colonialism, and most recently through international globalization. 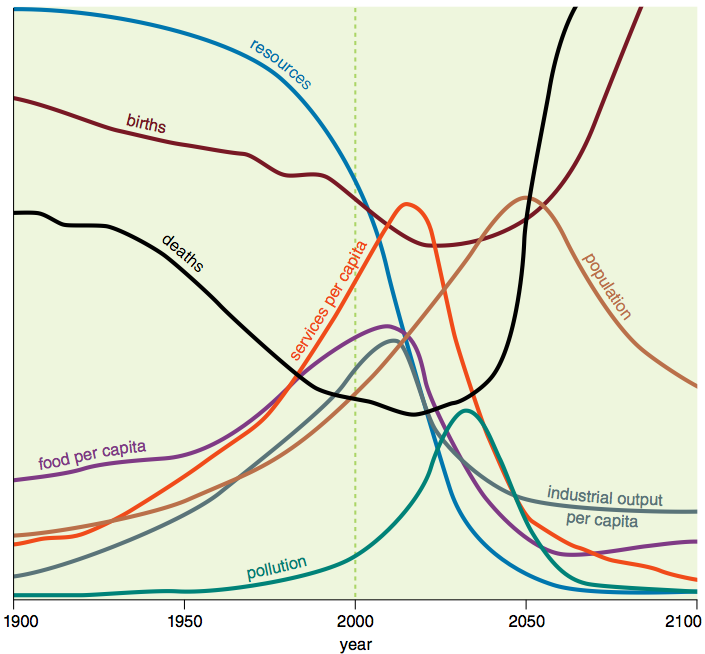 Globalization is necessarily the end of this growth. 4. Globalization sows the seeds of its own demise because factory workers are effectively forced to compete for wages with workers from around the world. Workers in the Global South can get along with lower wages for a number of reasons, including the fact that they tend to live in warmer areas, so do not need to build as sturdy homes and have less need to heat them. With fewer jobs and less investment in the Global North, demand falls and debt defaults become more of a problem. 5. In the normal scheme of things, world systems would rest and regroup once resources reach some sort of crisis point, defined by Liebig’s Law of the Minimum. Soils would build up again; aquifers would refresh; climate would reach a new equilibrium; and a different group of plants and animals would become dominant. Oil and gas supplies might even be rebuilt, over millions of years. It is not clear that humans will be part of the new world order, however. Over the past 100,000 years, man’s record of sustainably using natural resources has been poor. Humans differ from other primates because of their relatively larger brain size, but humans have not used this intelligence to preserve the environment. Colin McEvedy and Richard Jones in Atlas of World Population History report that the final increase in Homo sapiens’ brain size to the current average of 1450 cc took place about 100,000 years ago. Homo sapiens became the first species to stop living inside local ecosystems. . . . Indeed, to develop agriculture is essentially to declare war on ecosystems – converting land to produce one or two food crops, with all other native plant species all now classified as unwanted “weeds” — and all but a few domesticated species of animals now considered as pests. The development of fossil fuels ramped up the attack on natural systems further. Fossil fuel could be used for irrigation, and to produce herbicides, pesticides, and fertilizer, allowing farmers to choose the crops they preferred to grow. Fossil fuels also enabled large fishing boats to deplete the oceans of large fish. Capitalism furthered this attack on the natural order by giving those who extracted resources from the earth profits based on this extraction. While governments may have taxed these profits, these taxes, too, were used for developing infrastructure so that man could continue his attack on the natural order, and this extraction of resources would become more efficient. The final tool man found in his attach on natural ecosystems was debt based financing. While debt had been used for many years, it took on a new role when economists started realizing that greater debt could be used to increase demand for goods. This happens because debt financing gives people money to spend in advance of when it is earned (for example, a car loan allows a person to buy a car that he could not otherwise afford). Because debt allows people to buy thing that they would not otherwise be able to afford, it has a tendency to raise commodity prices. These higher commodity prices make it economic to extract more marginal resources, such as oil in difficult locations. There are no doubt some natural forces operate at a pretty steady level indefinitely–gravity, for example. But many of the processes we experience are “batch processes”. We remain awake during the day; by evening we become tired, and fall asleep until the next morning. We eat, digest the food, and become hungry again. Movement of earth’s plates gradually builds up forces which are released by an earthquake. When force is released, the change can be quick and dramatic. Right now, one stress is that of limited oil supply. This is leading to rising oil prices and stress on economies of oil importing countries. The amount of food and other goods we have access to and the steadiness of supply depend very much on our geographical reach. In the earliest days, humans were nomadic, so that they could gather food from a wide area. It was not until about 10,000 years ago that humans began to settle down with agricultural existence. When a change to local agriculture took place, this change led to shorter stature and earlier deaths. Part of this was due to poorer nutrition from a less varied diet; part of this was due to an increase in the incidence of infectious diseases, because of closer proximity to other humans and domesticated animals. Now, with globalization, we have reached the logical maximum in our geographical reach. Those who are rich enough can buy foods from around the world. We also have access to computers and other high-tech devices that can only be made with inputs from around the world. Most people’s expectation is that somehow we will keep up this wide reach, even if our world financial system fails due to debt defaults, but we have no guarantee that this really will be possible. If we start re-localizing, we will likely run into problems that people have had since the dawn of agriculture. It is hard to grow a wide range of crops in one area. Weather conditions are often bad in one year, necessitating either multiple-year storage of crops, or trade with other areas. If we cannot maintain our use of antibiotics and of water and sewer treatment, deaths from infections may soar. Workers may expect to work more hours per week to earn the funds needed to support themselves and their families. Payments to workers do not need to include as much for healthcare benefits, or as much for retirement payments to the elderly, because of the younger workforce, and differences in the healthcare systems. Energy costs of workers are likely to be lower because of greater use of coal, smaller homes, less needed for heating in warm climates, and use of bicycles instead of cars. The unemployed need to be taken care of by government programs, even if they don’t have jobs. Demand for goods produced may fall. Neither the low-wage workers producing the goods in the Global South nor the workers without jobs in the Global North are likely to be able to afford the products that are being produced. Economic growth is likely to decline in countries of the Global North that outsource manufacturing and other processes. Debt is likely to become more of a problem in countries of the Global North, because of low economic growth or actual contraction. Laid-off workers are likely to find themselves less able to repay their loans. Governments are likely to find themselves in difficulty because of low tax revenues, high benefits to laid-off workers, and high debt levels. Thus, globalization sows the seed of its own demise. At some point, the system can be expected to fail, and regrouping will be needed. The path to failure seems to be through debt defaults, leading to falling demand for the products that capitalism provides. Once this decline starts, it is hard to see a natural “stopping point” for the decline. On the “way up,” businesses, governments, traditions, and even religious beliefs are built that reinforce the processes that are in place. For example, if a certain amount of oil, gas, and coal is being extracted from the ground, businesses will be formed that use these fossil fuels, and traditions will be started (for example, expensive healthcare for many, and college education for most) that will use these fossil fuels. Economics becomes the new religion, touting the benefits of more consumption. If the decline is to stop, we need a whole different set of businesses and traditions to support a much lower level consumption of fossil fuels and other inputs. It is not at all clear that we can adapt quickly enough for a change of this type. When we look back a few thousand years, societies had a surprisingly rich tapestry of businesses and traditions to support them. For example, David Graber, in Debt: The First 5,000 Years talks about the ancient (2700 BC) Mesopotamian city-states being dominated by vast temples where trading was done. It wasn’t until about a century later that Abraham left “Ur of the Chaldeans” (Genesis 11:31), a major port at that time. Part of our problem in going back is that we can’t even imagine what web of businesses and traditions would be needed to support a lower fuel use than we have now. We can build a garden in our backyard, and we can print some “local currency” for local citizens to trade, but these types of activities do not really fill the major void that would be left if our current approach to civilization fails. If we think about it, it is pretty obvious how humans could fit into the natural world better. We could behave like other animals. We could stop wearing clothes. We could stop living in houses. We could eat food in its raw form. This food would be only that which we can pick or catch with our bare hands. We could co-evolve with our fellow creatures. If a virus or bacteria comes along and kills off a significant share of mankind, or if a woman dies in child-birth, we could simply accept that as the natural order of things. I don’t think any of us would accept such a solution, though. It is just too harsh an outcome. Such a solution would not work except in very warm climates, and even there, we would need fire to cook meals and tools for killing animals. Under one theory, cooking of food is necessary for our current level of intelligence, so we could not give that up. We can’t know how our current predicament will turn out. Logic says that the natural system needs to rest and regroup after Limits to Growth are reached, in one way or another. Perhaps there is a “happily ever after” solution that will include a large number of humans. Unfortunately, it is hard to see what that solution might be. This entry was posted in Financial Implications, Planning for the Future and tagged capitalism, collapse, credit availability, debt limit, debt unwind, fossil fuels, globalization, limits to growth, resources. Bookmark the permalink. We have to be careful of The Confirmation Bias–the tendency of humans to only see evidence that supports what they already believe. For example, check out this concise, one page appeal for donations and note that we did, in fact, raise the money. Sometime this spring the Crop Mob (30 to 50 people) will arrive for a day of volunteer work to transform the lot into an urban farm. You see a reference to Two Ton Farm. That farm was started several years ago on a quarter acre next to a halfway house. That lot was transformed by the Crop Mob and is now growing enough food for a six member CSA, selling to several restaurants, and distributing free food in the mostly poor neighborhood. People in the halfway house help work Two Ton. So…Joel Salatin finds an incredibly productive one twelfth acre farm in downtown St. Louis. And notes that ‘we have 35 million acres of lawn and 36 million acres devoted to recreational horses’ and that there are no inherent barriers to growing plenty of food. He also notes that much of the vacant land is in inner cities (such as the gardens I refer to above). Yet in March, 2010, the Montgomery County, Maryland, school superintendent, John Weast, sent out a memo stating ‘Because vegetable gardens are a food source for pests, create liabilities for children with food allergies and have other associated concerns’, school gardens get the axe. Folks, this is beyond stupid. 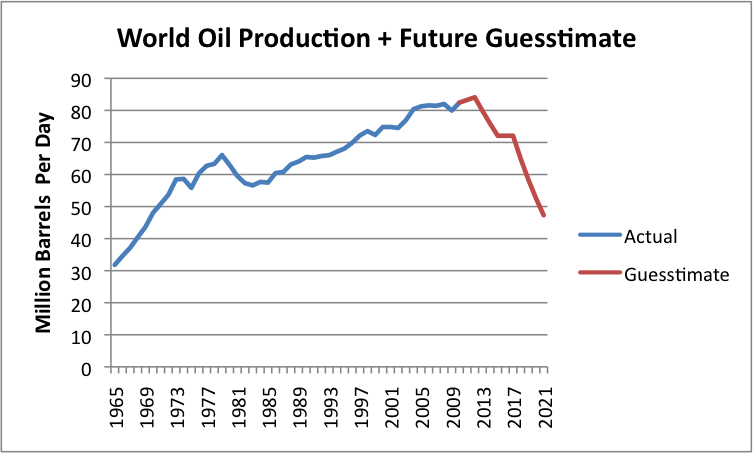 It won’t be Peak Oil that kills humanity, it will be stupidity. As to producing more calories than you burned producing the food. I don’t have numbers, but these efforts are a lot better than the 11 to 1 ratio of conventional agriculture. First, they focus on the high water content crops: fruits and veggies. Water costs a lot to ship and makes the produce perishable and so needs refrigeration. A neighborhood garden avoids all that expense and fossil fuels. And when people walk to the garden to get their greens and their apples, the most expensive part of the agricultural cycle is avoided–driving the two ton SUV to the grocery store. Any half-way competent gardener can garden with recycled nutrients. A good urban garden uses chickens, rabbits, and earthworms to recycle kitchen waste. And the urine from one human can fertilize one acre. The high calorie count grains are dry and are relatively cheap to transport. High calorie count meat is more problematic because it needs refrigeration. But if you see Sharon Astyk’s current post, you find that two thirds of the cost to the consumer is complying with useless, idiotic regulations. If you really want a bellyfull of explanations of just how stupid the regulations have become, read Joel’s book. The school superintendent would be proud that our ‘advanced society’ has been able to develop all this idiocy. My sister teaches high school in New Jersey. She got approval to turn an unused courtyard into a Permaculture demonstration perennial food forest. She rounded up grat money to buy the plants and supplies. She got students involved — many of whom gave up personal time to come to after-school planning sessions — and turned in a beautiful design. But the local fire department said they can’t put anything within 50 yards of a building that was taller than mown grass. So here’s a counter-example of a willing school, but obstructionist “public health and safety” bureaucracy — beyond stupid, indeed. The ones who survive will be those doing things in open defiance of bureaucracy — if they can last so long. I will put in a word for the LTG people. They never claimed to be making a model that could predict exact dates. They made a model that demonstrated the dynamics of the system. It is just dumb luck and great insight on the part of the modellers that it is doing so well so far.